West Brom are on the higher end of the Premier League's lower class, where good seasons involve winning relegation battles with a few weeks to spare and bad ones involve fingernails gnawed down to the nub. As such, they have little to offer players with loftier ambitions and the talent to get them there. So when they do happen upon a player, usually young, who shows the ability to excel at something more than relegation fights every year, they have to sell him. This is basically the current situation between the club and their 21-year-old striker, Saido Berahino. Berahino has spent his entire playing career with the Baggies, joining the club soon after emigrating from the tiny African country Burundi. He made his way through the youth ranks, was sent out on loan a few times to get more match experience, and eventually broke into the first team last season. That year, as predominantly a substitute and at times a spot starter, Berahino was West Brom's joint-highest scorer in the league with five goals. 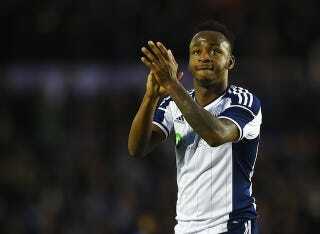 Berahino's growth has only continued this season. The striker is an unquestioned starter, and has been about the only bright spot for one of the worst attacks in the league. His nine goals are tied for 6th-best in the EPL, and account for a whopping 45 percent of the team's overall tally. Naturally, English teams higher in the table and on the money list have lasciviously eyed the kid's progress, hoping to lure him away with promises of riches and the chance to actually win something. In the January transfer window, his name was repeatedly mentioned as a target for Liverpool and Tottenham. Though no concrete bid materialized, it was obvious that it was only a matter of time before Berahino was off for greener pitches. "I'm taking care of my short-term goals right now and if I keep scoring goals and doing well for West Brom, I know the future will be bright for me and I'll go a long way. "I need to stay focused on what I'm doing right now, which is scoring the goals and keeping West Brom in the Premier League. "If I can keep them up and score as many goals as I can, I'm pretty sure the fans wouldn't mind me pushing on and moving on to bigger things." That is an exactly correct explication of things. Berahino is of course aware of the interest surrounding him, hopes to continue doing what he's been doing, and even expresses concern for the Baggies' Premier League fate. Albion will reluctantly allow the England under-21 international to leave the Hawthorns at the end of the season in what appears increasingly likely to be an acrimonious parting of the ways. Berahino is also set to be fined for an interview with Sky Sports ... in which he admitted he hopes to "move on to bigger things". Berahino's interview comes three weeks ... after pleading guilty to drink-driving and has infuriated senior members of the dressing room. Albion officials are also growing increasingly exasperated with his conduct and will abandon plans to restart negotiations over a new contract. This statement serves two objectives. First, it's a naked power move meant to show Berahino who's boss; second, it's a signal to fans that the inmates don't run the asylum. Nothing Berahino is quoted as saying is objectionable on its face. What his words do intimate, however, is that he is now playing for himself and his future—which was always going to take place away from West Brom—rather than "serving the club" or "concentrating on the team" or whatever other combination of words they can come up with to disguise the underlying message: You work for us, not the other way around. The little show of muscle-flexing is embarrassing and pointless—Berahino himself really is more talented than the rest of the roster put together, which makes him way more valuable than anyone else in the dressing and board rooms; he and his suitors were always going to get their way—but the public relations aspect is a little more understandable. Barely. West Brom may be small, but their fans still hope for a better future. And supporters aren't too keen on seeing their club's most tantalizing prospects being openly speculated on. In some fans' minds, the unseemliness of all this is enough to turn them off on both the "selfish" player and the unambitious club. Hence West Brom's leadership feeling the need to crack the whip here, even if Berahino's only sin was verbalizing the situation's obvious subtext. Here's the thing, though: all parties involved would be much better off accepting reality. There is a way West Brom could paint the striker's inevitable sale as a win-win-win for the club itself, the fans, and the player. The Baggies stand to make bank on the transfer. They've already said that they'll take nothing short of £20 million in exchange for the player, which is a huge amount for a club of this stature. The team could then explain to the fans that they plan on investing those proceeds back into the squad, strengthening it in order to build something that could more easily hack it in the first division, and hopefully they'll luck up on a couple youngsters with the ability to develop into the next Berahino. Just ask Southampton fans if this strategy of developing, selling, and improving is one supporters can get behind. If West Brom decided to carry it like that, they'd also maintain a positive relationship between the club and a player they've known since he was just a little boy trying to adapt to an strange new country, aided by his love of the game. Berahino is likely to make his senior international debut for England sooner than later, and if he keeps on the trajectory he's on now, he could become a regular player for the Three Lions. Why alienate him and your fans from him when instead you could hold him up as a testament to the club's values and talent-spotting ability, looking at him not as a greedy ingrate but instead as the quintessential West Brom success story? Apparently, all of this foresight is too much to expect from the vindictive people in charge over there. They'd rather take the easy way out and color Berahino as a malcontent for having the temerity to be honest, all while they eagerly await their impending payday. Instead, they seem a lot more preoccupied with their short-term goals. Maybe Berahino is the perfect embodiment of the club, after all.